Everybody knows that getting the job done right is mostly dependent on having the right tools. That's why if you want to actually have a good, non-stressful time in the kitchen, and be able to share the joys of it with others, it's absolutely imperative that you invest in the right gadgets and utensils to maximize your productivity while working smarter, not harder. So, let's get into it, here are some of my favorites that get used religiously on a daily basis. I love me some Tovolo. 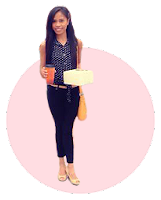 They have a really sleek line of products with nice grips and easy to clean material. This utensil in particular to me is like one of those multi-tool pocket knives, but for the kitchen. 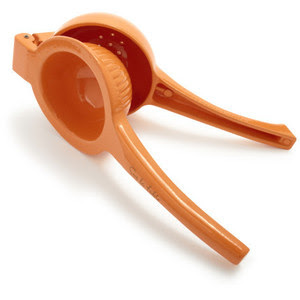 One end is a silicone spoon that I use for stirring, scooping, tasting, mixing - and the other end is a flat tough plastic (for lack of better term) that is great for cutting soft foods, slicing butter, scraping gunk off pans, or you can even use it for what it's intended for...spreading stuff. Also, this scrapes the nooks and crannies off of EVERYTHING. I usually prefer stainless for food prep and glass for food storage, but to be honest, it really doesn't matter. Just remember stuff like most stainless is not microwave safe (you'll ruin your microwave) & glass can suffer from thermal shock (could break in the oven). Or, steel bowls will conduct heat better but glass will retain heat better. So basically, with those few things in mind you can decide what will work best for your application. Be sure to have various sizes and even multiples of the sizes you use most. You'll be surprised how essential you find them to be once you have them. Although I LOVE Staub and Le Creuset, I found a 5qt enameled cast iron dutch oven at HEB for $30. Out of curiosity, I purchased it. If you don't own one and would like to test out the waters before splurging on higher end versions, here's a great buy. It's only about $150 or more, LESS than the top name brands. Lodge carries a line that's just as affordable. (Can't go wrong with Lodge!) Yes, the designs are beautiful on our high-end products, but the at the end of the day the functionality is fairly identical. Cast iron takes a little while longer to heat up and once it does, it gets hotter and holds heat evenly, all around, better than most other materials. Great for searing tough cuts, then adding liquid and braising at low temp. for hours in this air tight pot to get the most supple, tender stew meats as opposed to other cooking methods. Just consider the weight of them your workout for the day. 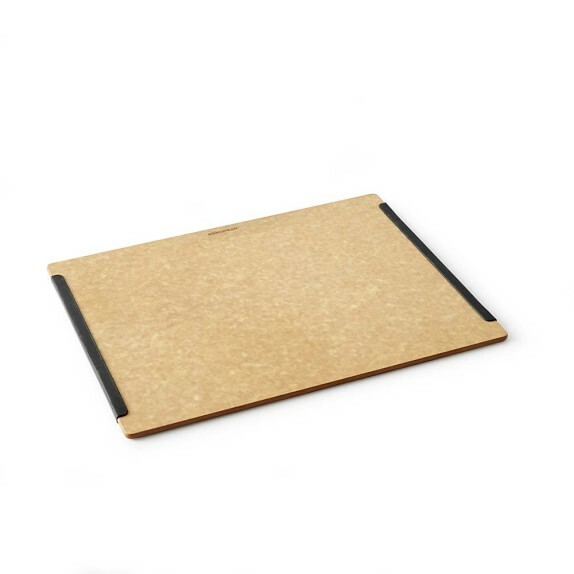 It's a safe bet to get in the habit of reaching for wood or silicone so as to not damage the more sensitive coatings and materials we may find throughout our kitchens, such as coated pans (even if they say they're metal utensil safe, prolong their life by using wood or silicone instead). Even a silicone whisk comes in handy at times, like when you're whipping up a midnight snack and don't want the loud clanking from metal on metal that will wake the dead. *TIP* Try not to store wood and silicone utensils with knives since cuts can harbor bacteria or cause a small chunk to fall off into your food while cooking. Also they don't like direct flames, so none of that. There are plenty of ways to juice citrus but lately this has been a time saver and really easy to clean. They have sizes for limes, lemons, oranges, etc...but I chose the orange size from the SLT line. Critical word of advice: once you halve the fruit, the cut side goes FACE DOWN. It essentially flips it inside out leaving you with just the pulp. You can always ignore this and find out for yourself but I'm trying to save you an eyeful of sting here. 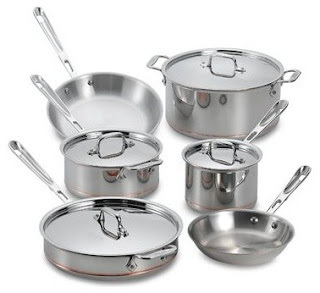 Always best to have an arsenal of different sizes and finishes to be ready for any type of cuisine or cooking method. But if you must settle on only a few, go with stainless and cast iron. Non-sticks are great for that, not sticking, but they also have a coating that inevitably comes off after a while of wear and tear. Something most people don't think about is with non-stick, you pass up on deglazing after searing something. You know, that brown stuff at the bottom of the pan that makes THE best pan sauces? On the bright side, they make for super easy clean up. As with anything, there are tons of pros and cons. But if you ask me, start with good quality stainless steel that will last several lifetimes with regular care (Barkeeper's Friend). Not a stock photo, these all live in my kitchen (should have never watched Kill Bill). Trust me when I say you don't need more than 3; an 8" Chef's knife, a paring knife, and a serrated knife. Even that last one is subjective but it comes in handy for soft or soft-skinned items like tomatoes. The best advice for choosing knives is to go to a local retailer and feel them in your hand. Make sure to use a "pinch grip" to get an idea of how proper use of that particular blade is meant to be. You'll never experience the joys of cooking/being in the kitchen without owning a sharp, high-quality knives. Believeeee meee! One of the most under utilized ingredients in the kitchen is the zest of our citrus friends. We love them for their juices, but the outside layer is full of fragrant oils and bright flavor that can enliven a dish, cocktail, or dessert like none other. 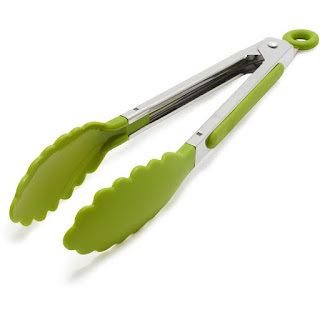 These also come in handy for finely grating cheese, ginger, garlic, wedges or spices such as whole cinnamon and nutmeg. Watch those fingernails, though, these tiny blades are sharper than you think. This mini processor by kitchen aid has been with me for the last 7 years. Ok, maybe not THIS exact one...I broke the lid of the first one, but never thought twice about purchasing a different brand or size. I loved it so much I went out and bought another one of its kind and model. A standard size makes sense if you do big batches of cooking, but I have limited kitchen space and I'm the only one who uses it, so this fits my needs perfectly. This product defines "tiny but mighty." From salsa, chunky sauces, homemade nut butters, combining dry spice mixes, pasta dough, chopping, mincing, etc, this will do the job. 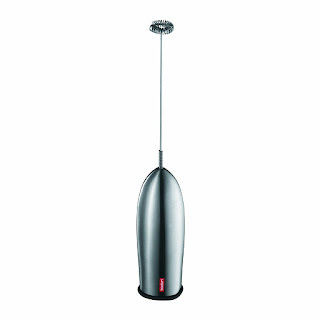 Although my Vitamix is fully equipped to deliver THE most beautiful froth to my bone broths, lattes, hot cocoa's, I love being able to grab my frothing wand by Bodum when I'm crunched for time or when the thought of having to wash more dishes isn't quite appealing (which is 98% of time). I've been using this for the last 4 years and still functions like new. It's battery operated and super lightweight so you can literally take this with you and froth up your drinks. Anywhere, anytime. Not that I've done it. Just a suggestion... one I might actually take. I hate when my lattes go flat. Ahh yaaa, first world probs. And if you haven't jumped on this whole "frothing" deal yet, get on it soon! Specifically during meal preps and larger-scale cooking, peelers exist to diminish the tedious task of peeling without actually thinking about how the hell you're doing. Unless I'm carefully paying attention, I do fine without one but ain't nobody got time for that. Literally. 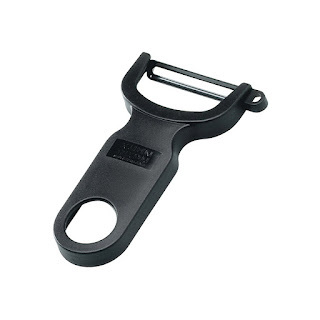 Although I own a kitchen aid, a Cutco, and some generic brand that gets the work done, I seem to gravitate more towards my Kuhn Rikon peeler. Not only is it lightweight, the sleek handle allows for alternative grip and motion that results in efficient work. I was reading reviews about this particular product and noticed complaints with rusting issues... Don't put this in your dishwasher. Simply rinse and dry immediately. 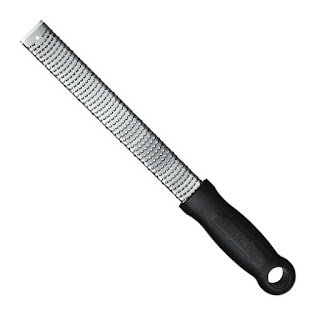 I would hope you're not using this to peel meat or seafood? So, rinsing without dishwashing soap (which is abrasive) will suffice. I remember one of my brothers telling me when his wife (then girlfriend) first came around, she hesitantly asked him, "why does your sister have so much cutting boards?" OCD, germaphobe, that's why. The importance of having designated cutting boards for different proteins, veggies, and fruits should always be considered. It's always a bit icky to me when I see ONE cutting board in someone's kitchen. No judgements, but yes I am counting how much cutting boards you have. You do what you want...but think about it. If you opt for bamboo, or plastic make sure to replace them (at least) every 6 months to a year. After seeing how much I used my baking sheets, mainly for roasting large quantities of veggies for meal prep, they all noticeably warped permanently, causing unstable heat distribution, meaning uneven cooking. Never a good thing, especially for cookies and other baked goods that require such handling. I made it a priority to upgrade commercially in hopes it would last me *crossing fingers* a lifetime. So far, so good! I have (I kid you not) about 10 of these bad boys. They're not only for the oven, they're great for drying things out, cooling down pastas, quinoas, rice, etc in a pinch. From roasting, toasting, broiling, to the obvious: baking, grab yourself a handful of these heavy-duty metals! From leftovers, homemade sauces and dressings, meal prep containers, to simply having an organized kitchen, Mason jars, and everything from The Container Store will help cover all the bases. I completely agree with you that the above-listed gadgets are must-have! You may enjoy reading this content about the latest kitchen gadgets. I've got lots of them on my own kitchen and I'm sure you'll also choose something for yours ;) By the way, my children also enjoy cooking due to them!